Commercial buildings often live multiple lives, changing with their neighborhoods. Such is the case with the Dishman Theater. 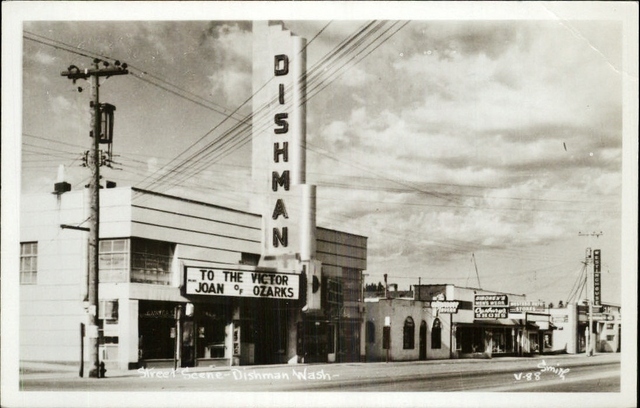 Dishman Theater opened its doors on November 6, 1938. It was to be the first and only theater in the Spokane Valley for many years. Most Valley residents lived on quiet orchards and farms and the opening of the Dishman Theater provided them with affordable entertainment. The Dishman Theater was furnished with seating for up to 516 people and boasted $20,000 worth of equipment, including earphones for the hard-of-hearing. The theater was built by A.T. Dishman, a pioneer valley resident who operated a nearby rock quarry and founded the town of Dishman. The Art Deco-style building has solid concrete exterior and cost approximately $50,000 to build. The first featured film was "Holiday" starring Cary Grant and Katherine Hepburn. In addition to local patronage, the Dishman was supported by travelers on U.S. 10, the Sunset Highway. Before the construction of the interstate highway system, Sprague Avenue was also U.S. 10, the primary route across the state. In an era when neither cars nor motel rooms had air-conditioning, a double feature at the air-conditioned Dishman Theater made for a welcome reprieve. For most of the Dishman's existence it was a family theater. From 1951 to 1966 the theater was run by Al Baker. Baker remembers "trying to keep the moral tone elevated" and the Dishman attracted more children than any theater in Spokane. By the late 1950's and early 1960's there were so many kids "they drove the adults right out of the theater" said Baker. By the 1970s the neighborhood was changing. The construction of I-90 divided many Spokane neighborhoods and took traffic and customers away from Sprague Avenue. Dishman went through a series of owners, and in 1978 began showing X-rated adult films. The Dishman Theater is now home to the De'ja' Vu, a "gentleman's club." The interior was completely renovated to accommodate its new clientele. Robin E. Johnson, “The Dishman Theater,” Spokane Historical, accessed April 20, 2019, https://spokanehistorical.org/items/show/630.